After the German phpBB Association’s general meeting on Saturday a group of developers spent Sunday making some great progress toward a first phpBB 3.1 Beta release. The German phpBB Association runs phpBB.de – one of our many international support sites. 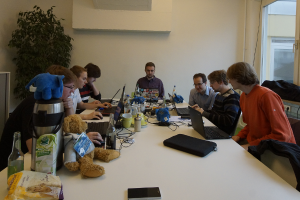 A number of German phpBB developers – including me – are members of the German association and decided to use the opportunity to work face-to-face for a day. We were joined by phpBB.de volunteers who helped with bug triaging and pull requests and worked on translation related projects. We managed to merge the password hashing manager which will allow us to easily transition to newer more secure password hashing algorithms in the future. It will be the basis for an easier conversion process from hashing algorithms used by other forum software. Currently switching from another forum software to phpBB requires the use of a custom authentication plugin to keep passwords working. The refactoring of profile fields which was merged at the event will allow extensions to work with profile fields and add new types of profile fields. This is a first step toward modularizing the entire profile so that all default fields can be configured by administrators. After a lot of debugging over the past weeks we finally worked out why our tests were failing on PHP 5.5. It turned out that PHP 5.5.7 which is used on Travis CI has a bug in the OPcache extension. The OPcache extension is the new default opcode caching mechanism in PHP 5.5 which greatly speeds up the execution of PHP code. On our path to Alpha3 – hopefully the last Alpha release of phpBB 3.1 – we also spent some time working on bugs in the build process. These prevented us from building packages for Alpha3 so far. As a consequence we will stop providing old text format MOD files for style and language file changes. We realized the algorithm may generate incorrect results which could go unnoticed, resulting in incorrectly updated styles or language files. Instead we will provide regular patch files generated with GNU diff. Alpha3 will contain all the improvements we finished over the weekend.